Paris from its highest point. With family visiting for Easter weekend, we left relatively early yesterday (Good Friday) morning for some sightseeing. With two under 10s in tow, we didn't climb up all of Montmartre but left at Abesses station, where the little ones liked the small playground, right next to the wall of "I love you" tiles in 300+ languages. I keep meaning to take the funicular, but this time T foiled the plan by insisting on walking the rest of the way with everyone else. It was freezing cold despite the sun, but relatively uncrowded when we got there at around 10 am. Despite being somewhat afraid of heights, I can't get enough of seeing cities from up high; the basilica glinted in the sunlight. 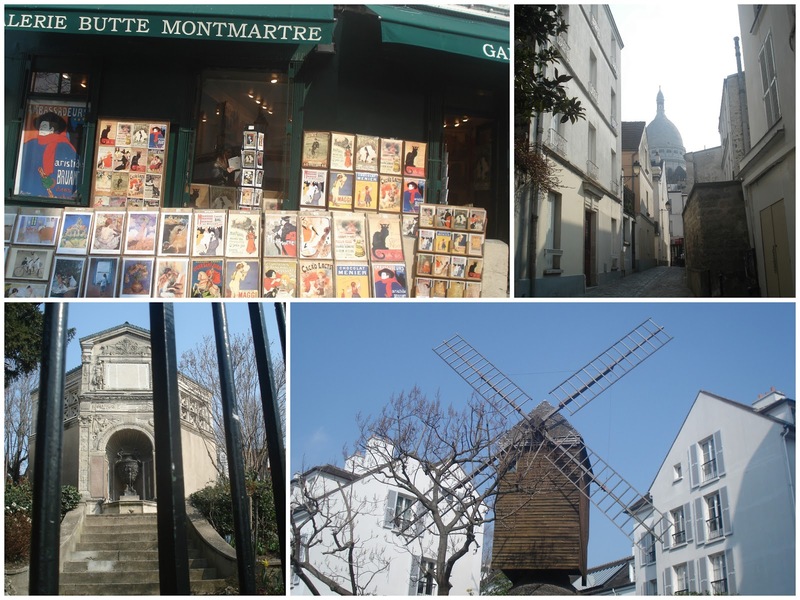 After a walk around the top of the hill, we headed over to Cimetière de Montmartre, by way of Moulin de la Galette and some other sights. At the graveyard, we visited the monuments and graves of German poet Heinrich Heine; Adolphe Sax, inventor of the Saxophone; Edgar Degas (who according to his Wikipedia article was an anti-Semite and can thus join my list of "great artists with despicable opinions"); composer Hector Berlioz; philosopher Jacques Fourier (who's discussed in Metropolitan); Alexandre Dumas fils (who I didn't know had a multiethnic background); and Jean Foucault of the pendulum - no relation to Michel. 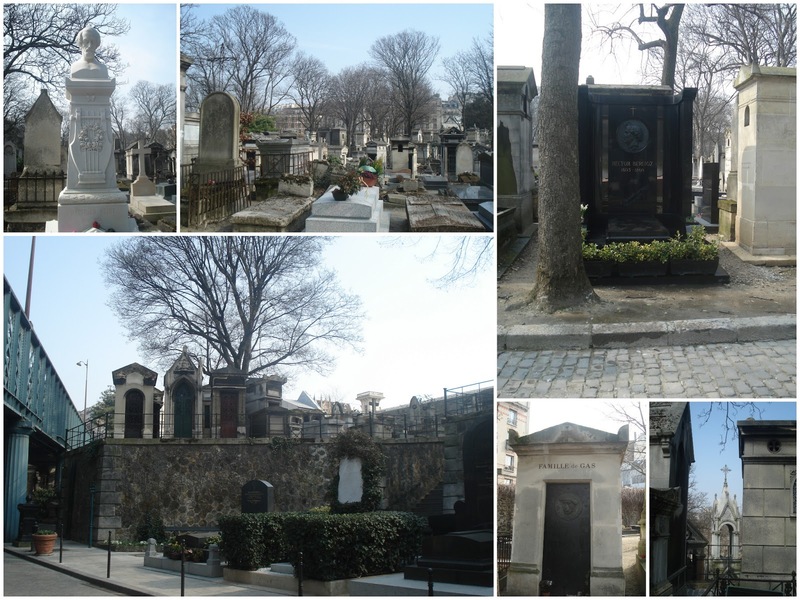 It somehow escaped my mother and me that Francois Truffaut is buried there too - I only found this out while researching. 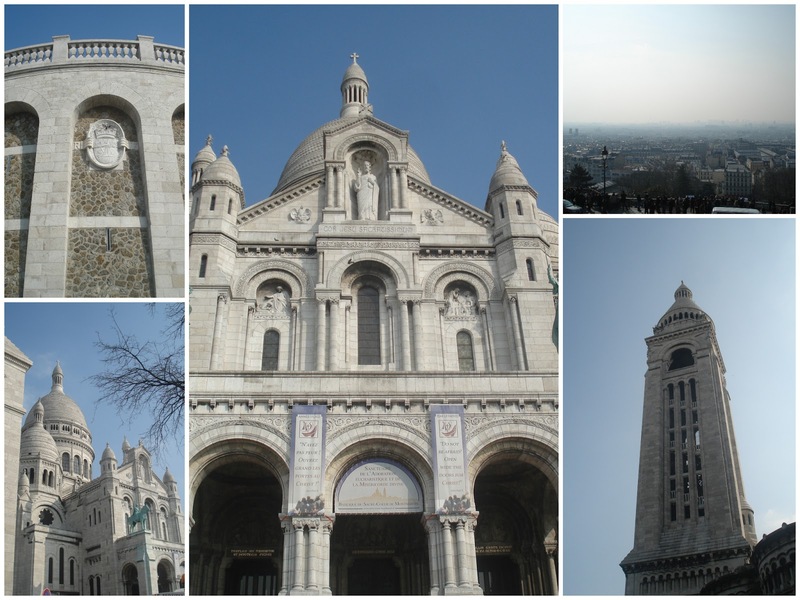 On taking a three-year-old to these locations: T loved spending time with my family and enjoyed the street performers at Montmartre and running up the stairs right in front of Sacré-Cœur repeatedly, but the longer we went, the more she requested to be carried. Her hard-hearted parents remained firm since she generally walks longer distances without (much) complaint, but family members jumped in (and eventually we relented, too). To her credit, she wasn't exceptionally whiny (though she couldn't see the appeal of the graveyard at all), but the highlight for her was definitely the post-sightseeing lunch. We then joined the others for a bit of time in Le Marais, which T remembered and loved from our previous visit there. In Le Marais, the kids tumbled on two well-kept public playgrounds: a smaller one near Oberkampf metro station and a bigger off Rue du Parc Royal (Square Louis Achille), just behind Musee Carnavalet. H, T, and I couldn't linger in Le Marais since we had to take the little bit to the dentist - where she was an absolute champ despite needing orthodontic gear (in the hope that this early treatment will mean she won't need much work later). Pictured: the playground near Oberkampf.